Summary and Definition: The Americans with Disabilities Act of 1990 (ADA) was signed into law on July 26, 1990 by President George H. Bush. The 1990 Americans with Disabilities Act is the most sweeping and comprehensive law ever passed to protect the civil rights of individuals with disabilities. The ADA went into effect on January 26, 1992 and is enforced by the U.S. Equal Employment Opportunity Commission. The law was enacted by Congress to protect equal opportunities in the areas of Employment, State and local government services, public and privately operated transportation, places of public accommodation and public telecommunications services. 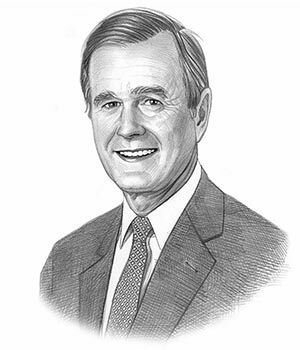 George H Bush was the 41st American President who served in office from January 20, 1989 to January 20, 2001. One of the important events during his presidency was the 1990 Americans with Disabilities Act. The following fact sheet contains interesting facts and information on the Americans with Disabilities Act for kids. Americans with Disabilities Act Facts - 1: The history of the Americans with Disabilities Act was sparked by the Civil Rights Movement of the 1960's and 1970's beginning with the establishment of the Independent Living Movement. Americans with Disabilities Act Facts - 2: The Independent Living Movement is based on the philosophy that people with disabilities have the same rights, options, and choices as anybody else. Americans with Disabilities Act Facts - 3: Members of the Independent Living Movement agitated for changes that would allow people with disabilities to become active participants in society and enjoy life, liberty, and the pursuit of happiness that was equal to citizens without disabilities. Americans with Disabilities Act Facts - 4: In 1972, the first Center for Independent Living was established in Berkeley, California by Ed Roberts and the Rolling Quads. Americans with Disabilities Act Facts - 5: The goal of achieving full participation in society led Congress led Congress to amend Title VII of the Civil Rights Act of 1964 by approving the Equal Employment Opportunity Act of 1972. Americans with Disabilities Act Facts - 6: The Equal Employment Opportunity Commission (EEOC) is the federal agency that is responsible for eliminating discrimination in all terms and conditions of employment, and was tasked with ending discrimination based on disability. Americans with Disabilities Act Facts - 8: The Civil Service Reform Act of 1978 was passed by Congress and the EEOC assumed responsibility for enforcing anti-discrimination laws in the civilian federal workforce. Americans with Disabilities Act Facts - 9: Despite the legislation of the 1970's, polls indicated that 67% of Americans with Disabilities were unemployed and many of those who managed to get jobs were only employed on a part time basis. Americans with Disabilities Act Facts - 10: The idea of extending civil rights legislation to millions of Americans with disabilities gained momentum with support from all political parties in late 1988 and early 1989 but experienced considerable opposition from the business sector. The following fact sheet continues with facts about the Americans with Disabilities Act for kids. Americans with Disabilities Act Facts - 11: Patrisha Wright, a disability rights activist was instrumental in enacting the Americans with Disabilities Act. Patrisha Wright, legally blind, was given the nickname of "the General" for her work in coordinating the campaign to pass the ADA. Americans with Disabilities Act Facts - 12: Tom Harkin, a United States Senator from Iowa, introduced the Americans with Disabilities Act into the Senate. Tom Harkin famously delivered part of a speech in American sign language so that his deaf brother could understand. Americans with Disabilities Act Facts - 13: If it passed, the Americans with Disabilities Act would ban discrimination based on physical or mental disability in employment and provide access to buildings and public and private transportation. Americans with Disabilities Act Facts - 14: The Americans with Disabilities Act (ADA) had four goals for people with disabilities: equal opportunity, full participation, independent living and economic self-sufficiency. Americans with Disabilities Act Facts - 16: There was considerable opposition from many different businesses based on the enormous cost involved in complying with the provisions of such a law and the US Chamber of Commerce argued that the costs of the ADA would have "a disastrous impact on many small businesses struggling to survive." Americans with Disabilities Act Facts - 17: Disability Rights Activists mounted a strong campaign to support the Americans with Disabilities Act which was experiencing delays getting through the House of Representatives. The campaign arranged a rally that culminated with a shocking and heart wrenching protest on Monday, March 12, 1990 that became known as the "Capitol Crawl". Americans with Disabilities Act Facts - 18: During the "Capitol Crawl" more 60 activists shed their crutches and abandoned their wheelchairs and mobility devices and began crawling up the 83 stone steps to the U.S. Capitol Building. Americans with Disabilities Act Facts - 19: The opposition to the Americans with Disabilities Act evaporated and four months later the ADA was signed into law on July 26, 1990 by President George H. Bush. Americans with Disabilities Act Facts - 20: On signing the ADA, President George H. Bush said "...Let the shameful wall of exclusion finally come tumbling down." Americans with Disabilities Act Facts - 21: The ADA Amendments Act of 2008, effective January 1, 2009, amended the Americans with Disabilities Act of 1990 (ADA) and other disability nondiscrimination laws. The reason for the amendment to the law was to overturn two controversial court decisions based on interpretations of the ADA. The article on the Americans with Disabilities Act provides detailed facts and a summary of one of the important events during his presidential term in office. The following George H Bush video will give you additional important facts and dates about the political events experienced by the 41st American President whose presidency spanned from January 20, 1989 to January 20, 2001.